Providing you the best range of capillary seal type remote diaphragm and remote seal diaphragm transmitter with effective & timely delivery. A remote seal transmitter includes a pressure transmitter, a remote seal and a capillary tube connecting the two. Together, they transmit the pressure in the process fluid to the transmitter sensor indirectly. Remote seal transmitters are used when it is necessary to isolate the transmitter from the process for any reason. The process fluid may be at an elevated temperature. The process material may be a slurry that would clog standard instrument lines. It may be corrosive. 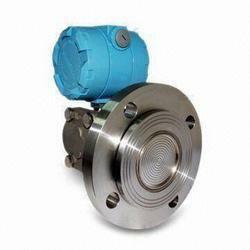 The process fluid may freeze or solidify during swings in ambient or process temperature. One would also use this type of seal for applications in which the wet leg is not stable or often needs to be refilled. For density or interface measurements and for aggressive, corrosive, high viscosity, heterogeneous or toxic processes. Process fluids that may obstruct the connection or collect on the sensor, like crystallization steps and polymerization reactions. Seals offer significant installation flexibility and maintenance advantages over wet leg systems. Remote seals make it easier to maintain the fluid between the tap and the transmitter, especially on the reference (low pressure) side. In vacuum systems, a closed seal system, rather than an open wet leg, maintains a constant height for the low side reference. The seals do not need to be refilled or drained. The seals are not susceptible to plugging or freezing; plus they can be easier to control than wet leg systems. Location of the transmitter (indoor versus outdoor). Flush flange seals include a mounting flange that assists in aligning the diaphragm with the process connection. A flush flange seal also allows the use of a flushing ring between the diaphragm and the process flange. Flush flange seals with lowers are used when an adapter is required between the seal and diaphragm so that larger diaphragms can be used on smaller process connections. Extended flange seals provide a choice of extension lengths that mount on a pipe flange and extend in toward the tank wall. The diaphragm can, therefore, sit flush with the inner face of the vessel. Diaphragm Seal Transmitters are normally used for measurement of Chemical Fluids, Corrosive Fluids and fluids that may damage the Sensor diaphragm.